Hello! It's Jennifer and I'm so excited to share my layout with you today using the Simple Vintage Christmas collection! What is not to love about this line from the gingham and plaid prints to the traditional holiday tones. I thought instantly about doing a page with an "old fashioned" photo and found these gems from when I was a little girl. I was so proud to wear my Christmas dress and so grateful my mom took photos of me. I started with a kraft cardstock background mounted on the beautiful plaid print of the B side of Dear Santa. I love incorporating Simple Stories' cut files from the Silhouette shop and used the "Circle Wreath" with the musical note print of Jolly Holiday. I then added embellishments from the Bits and Pieces pack as well as the 12x12 Combo Sticker Sheet. around the wreath. For my title, I popped up one of the sentiments from the Combo Sticker Sheet layering it over a beautiful poinsettia die cut. I also used pop dots on the vintage Santa found in the Bits and Pieces and accented with smaller embellishments such as Chipboard hearts and star die cuts. I typed my journaling on one of the 3x4 Elements as well as added a bit of the adorable Washi that coordinates with the collection! Thank you for reading today! I hope this inspires you to scrap some of your older holiday photos! Maybe even do a page about you! Have a great day! Hi everyone! Thanksgiving to me is a time to share love and laughter with family and friends with all of our favorite comfort foods. At our annual Thanksgiving dinner, I make the main portion of the meal but ask everyone to bring their favorite dish to share. As we our enjoying our meal we always say how wonderful everything is and we wish we had the recipes to make the dishes ourselves. So in the spirit of Thanksgiving I decide to create a family cookbook to collect all of those divine recipes that I want to enjoy all year long! I chose three of the beautiful patterned papers from the 'Forever Fall' collection and folded up one edge to create a pocket. Using my sewing machine I stitched around the sides and bottoms for extra detail and then folded the papers in half to create 6 pockets.Since I knew this would be used in the kitchen, I gave it a clear cover cut from an Avery job ticket holder! I stacked all of the pockets together along with the plastic and sewed down the center to keep it all together! I used the charming and beautiful journal cards, Bits & Pieces, chipboard and stickers to decorate and embellish the cover and pockets of my cookbook. I also added in some fun family Fall photos along with some journaling areas so this will be a treasured keepsake as well! I made the recipe cards using the other patterned papers in the collection and some of the gorgeous 'Forever Fall' digital images that are available. Using a paper design app, I made the recipe cards and printed them put onto heavy printer paper. Easy peasy and super cute! I scored all of my cards so they can be open or folded close. Each page was given a tab made with the stickers of the collection and then I used a label printer to make the labels so the recipes will be easy to organize and find. I have a feeling when my friends and family see this adorable collection cookbook they will all be wanting one for themselves! I have a video on YouTube so you can see all of the details of this wonderful cookbook! Wishing you all a very happy Thanksgiving! Leaves are Falling, Autumn is Calling. Oh how I wish I live where the leaves change color and fall to the ground. Pumpkin Spice and everything nice is in full swing. I love everything about the "Forever Fall" Collection. I'm embracing Fall with the the elements this collection has to offer. To create this cover for my Monthly insert, I chose the "changing leaves" 12x12 paper as the background. I then added washi tapes on the top and bottom border. I finished it off by adding embellishments from the bits & pieces and chipboard stickers. 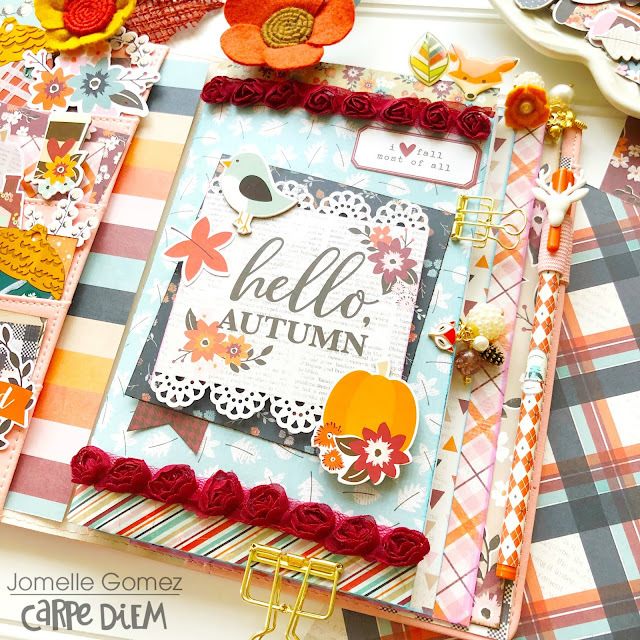 The "Hello Autumn" in the center is from the 4x4 element paper that I cut out and used my punch on top and bottom. Do you like to decorate you planner pockets? Or are you the "functional" type? I like mine to look pretty so whenever I open my TN I will be inspired. Not only do I love everything about Fall, November is my daughter's Birthday Month. I am looking forward in celebrating her birthday in Seoul, Korea. It's Autumn there so I can just imagine all the beautiful pictures we can take while we are visiting. I can't wait to add some journaling and memory keeping in my TN. Here is my Set Up using the Blush A5 Planner. I printed out some of the digital elements ( blue mushroom and couple of acorns) and cut them manually and used them to decorate my planner pockets. I love how I can print them to the size I want, in this case I wanted them to be a little bit bigger than the bits & pieces. 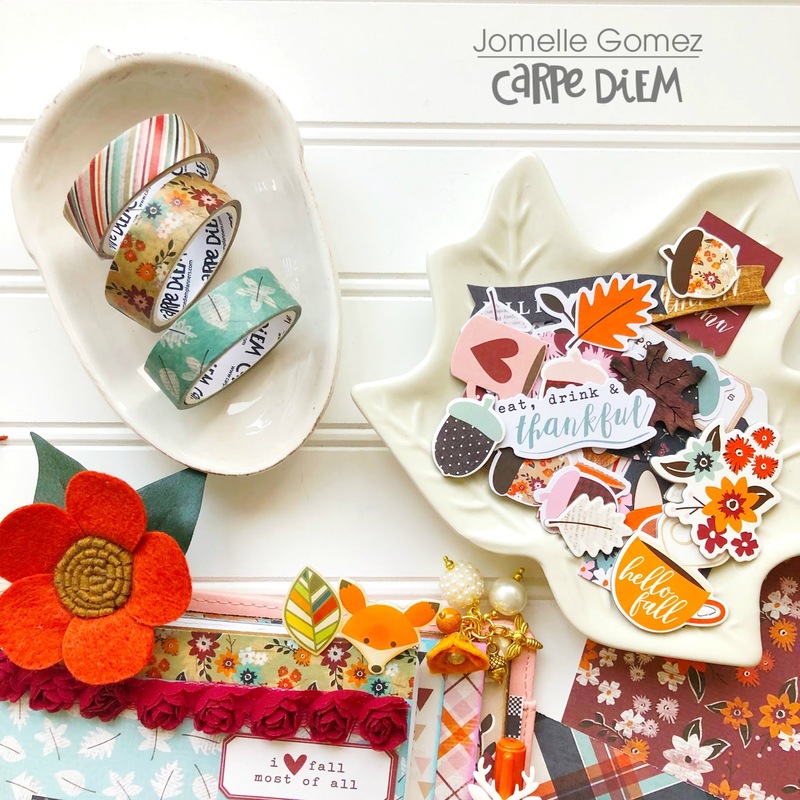 Fall washi tapes with the Forever Fall collection. What do you love about the Fall Season? The Most JOYful Time Of The Year! Hi there! Nathalie with you today to share with you a layout all about the most joyful time of the year, Christmas. The new Simple Stories collections are so festive and joyous that it was hard to chose which one to use to document a picture of my littles (niece and nephew). Well, after much debating, I went for the new MERRY and BRIGHT collection to create this page. To build this page, I used a Paige Evans cut file to create the wreath base from the 4x6 Horizontal elements paper and vellum, and then handstitched them to the Sn@p Basic 12x12 Cream ledger paper. The flowers were built and glued onto the page. Then i used a Silhouette design to cut the ivy and pine leaves that are layered under the flowers from the Joy and Happiness paper. The picture was then added in the middle of the flower cluster, and then just a few embellishments from the chipboard, puffy and cardstock stickers were added around it. To finish the page, the title was created using a die cut piece from the Merry and Bright collection along with a few more stickers. A few gold and white ink splatters complete this page. Love how this turned out, and i am sure my sister will be framing this page as a Christmas decor piece for her home. I hope you are all inspired to check the new Merry and Bright collection from Simple Stories, it is sure to help you record all your upcoming memories. Hello again, it’s Emma back with you, and this time I’d like to show you my early preparations for Christmas!, I know, I know, it’s only early November, but this year I’m determined to be all organized and ready! I decided to use the Simple Vintage Christmas collection, and I wanted to set up one of my TNs this year to organize everything ‘Christmas’. So, the first thing I wanted to make was a folder to fit neatly inside my TN, for it to have good sturdy pockets to house lots of tags. Here’s a picture of how the folder looked before I stuck it all together, hopefully you’ll find it helps if you’d like to try it for yourself. It was quite easy to make, I used one of the 12x12 sheets and double sided sticky tape to fasten together. I decorated the front using two of the cards from the snap pack, I find the selection of sizes and designs in the snap pack so useful for decorating my planners and of course for journaling on. You’ll see when the folder is open that I’ve made good sturdy pockets to store my tags. What I’m wanting to use all these tags for varies, I’m going to write lists on them, gift lists, Christmas card lists, food ideas, all sorts of things, I thought it would be a fun way to get me organized. The great thing about the lists being on the tags is I can pull out the tag, chuck it in my purse when I’m off to the shops, and easily tick off the items as I buy them! This collection also comes with tags that are numbered, I’m going to use these to journal on the back of each one, just a little something about that day in December, I won’t find it too daunting then as it’s not a large area to fill. I made my tags quite simply by using a 12x12 sheet from the Simple Vintage Christmas collection, I stuck ordinary paper luggage tags all over the sheet and cut them out. You’ll be amazed at how many you can cover with just the one sheet! I then tied some bakers twine on each tag. So simple! I even decorated the back of my folder, so once it’s slid inside my Carpe Diem Traveler's Notebook it will look super pretty. I hope you have enjoyed taking a look at my Christmas folder, next time I will show you how I set up the rest of my TN. If you would like to see more pictures using Simple Stories products then checkout my IG account. I always make my own Christmas cards to send to family and friends. Maybe you do too! Better get a move on because Christmas will be here before you know it. And, if you’re looking for the perfect collection for your card making you’ll love the Simple Vintage Christmas Collection from Simple Stories. The collection is traditional red and green with classic vintage images. You’ll love the stripes, plaid, floral and newsprint papers that are perfectly coordinated to mix and match. The collection includes die cut "Bits and Pieces", chipboard stickers, washi and more so you have lots of embellishments to work with! You’ll find journaling cards on the reverse side of some of the papers in the Collection Kit. I use the journaling cards as a focal point to embellish with die cuts and chipboard. This simple card was made with one large “Merry Christmas” chipboard sentiment on a background of “Believe” red and white gingham paper. You’re friends will be impressed with the thought and care you put into your hand made greeting, and you’ll love how easy it all comes together with the Simple Vintage Christmas Collection. Hello friends, Iris here on the blog today. Fall is our family's favorite season. We're eager for Fall as soon as school starts, but here in California, some years it comes a bit late. So I was tickled when I saw The Cut Shoppe's Finally Fall cut file that includes the "Feeling Fallish" sentiment. It makes the perfect title for this story about my daughter playing in a pile of leaves in December. Since she's wearing a non-fall colored shirt, the oranges and pinks of the Forever Fall line made it easy to scrap this photo. My goal was to emphasize vertical movement. On my background I splattered pink, orange, and teal inks starting from the top and widening towards the bottom of the page so that they mimic how leaves fall and scatter downward. I printed my photo tall and skinny (3" x 6") and matted it in the stripey Get Cozy paper. Stripes are always so fun for photo mats and I love that this one includes all the colors. I anchored my photo with a bit of the diagonal striped washi. To back my vertical title, I used some of the rectangular stickers from the 4x6 Stickers pack. I don't normally turn to those. They seem well suited for planners, but my planner doesn't have blocks of spaces. So I was thrilled to finally use them! They fit perfectly in the narrow openings of this cut file and the tiny scale of the patterns means you can still see the designs. I love hand stitching on my layouts but hadn't done much of it recently, so after I was sure of the title's placement, I used my hole piercer on the scripty word, snipped it off the top of the title, and hand stitched directly on the background in a dark orange thread that matches. Raining down above my photo are a cascade of die-cut and sticker banners and leaves. I filled a couple of the blank banners with heart stickers and randomly machine stitched through some of them. I hand wrote my journaling to the right side of the photo to balance out the large title on the left. For a bit of texture on this side, I stapled a little strip of cording that I knotted. To continue the vertical design all the way to the bottom, my date is stamped on a die-cut in the space below the photo, finished off with a heart sticker. Since my photo and the embellishments skew towards the right, I felt the left side needed something more. I added a thin strip of the stripey paper along the left edge of the layout, tucked a small word sticker under it, and as the final touch, stapled another piece of the cording above the words, to repeat how the cording is above my journaling. I just can't get enough of the Forever Fall collection. It's so versatile to capture all the Fall (and Fallish) memories, even when our kids aren't wearing the traditional seasonal colors! Hi everyone, it is Kelly here today with part two of my fall planner blog. In my last blog I have shown how I have setup my A5 Blush planner for fall and in today’s blog I will continue with some fun fall decorations in my planner. I used the punch and A5 divider template to cut a new front dashboard out of the fall floral paper. 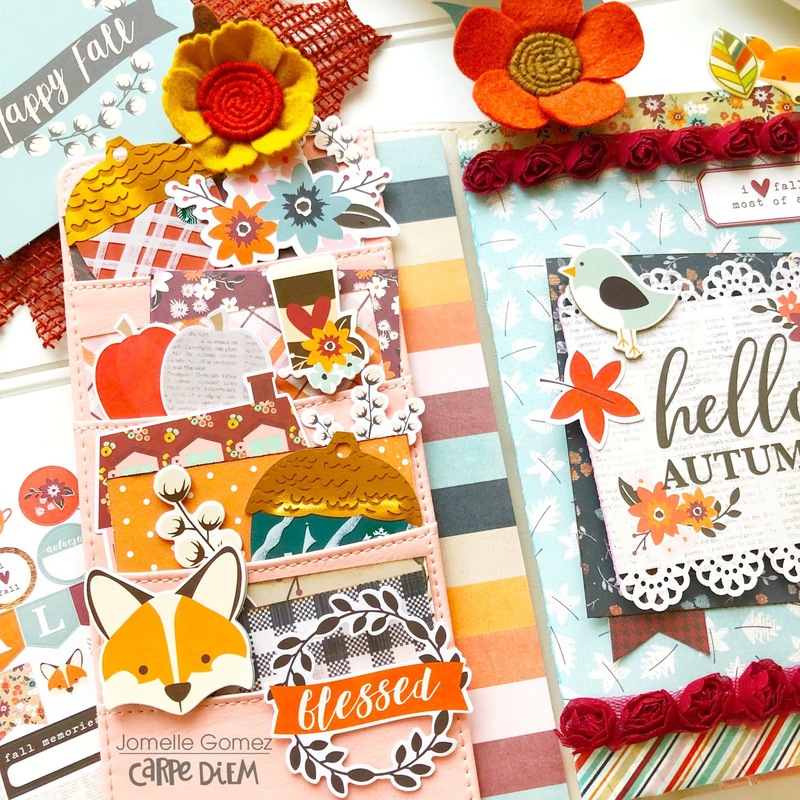 Besides the floral background paper, the other main decorative element of this dashboard is a 4x4 card with the text ‘Hello Autumn’. I layered the card with a few other pieces of paper and some stickers. I punched a lot of fall leaves out of different papers from the collection and I made sure to include all the different colors of the collection. Next, I layered the fall leaves down the middle of the two-page week spread to create a fun effect. Some leaves went over the holes, so I had to use a hole punch to punch them again. I used the yellow number stickers from the ‘Numbers’ sticker tablet to date the days. And lastly, I added some functional and decorative stickers. If you have read some of my blogs before, I love to make flag paperclips. You only need a paperclip, piece of paper and some stickers/ephemera and you can make a fun little decorative paperclip for your planner. I hope you have enjoyed reading this blog, check out my instagram account createplannernl for more inspiration. Marcia here today. I hope you all had a spooktacular Halloween! Did you get some great photos of your little monsters? The Simple Stories Simple Vintage Halloween collection is perfect for those Halloween photos ... but it can also be used to document your Day of the Dead celebrations too. My little nephew got his face painted for the occasion and I thought I would scrap it with a big sugar skull from the Silhouette store. I backed the sugar skull digital cut file with lots of different pattern papers from the Vintage Halloween collection. 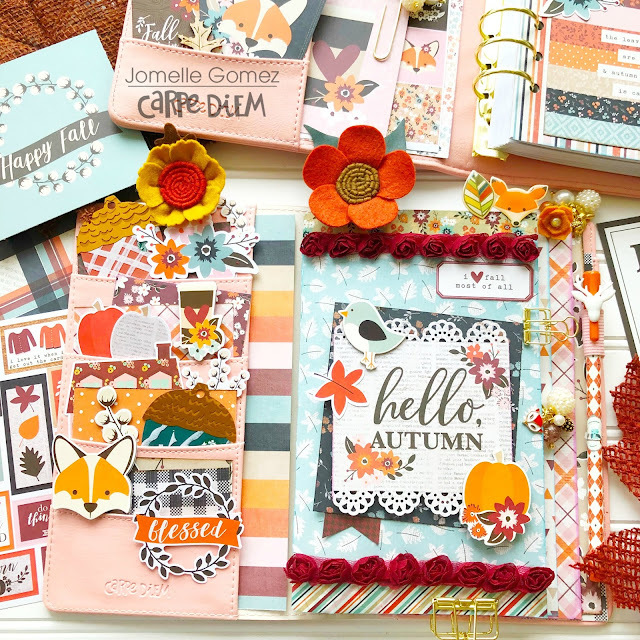 One of the things I love about this collection is the layering of elements on the stickers and pattern papers. It makes it easy to scrap, but it looks like you spent hours. You can see buttons, doilies, and brads ... but on a sticker or on paper, they add no bulk to your layout. I used the Spooky Sweet die cut for my title, and layered lots more bits and pieces die cuts, chipboard, and stickers around it. This collection has some awesome washi tape. You can see it near the top and bottom of my layout. I think the one with the pumpkin faces is my favorite. Thanks so much for stopping by today and Happy Day of the Dead. Documenting the Days of December! Hi everyone! Odessa here, bringing you some more December documenting inspiration! When I opened the Simple Vintage Christmas products I was all heart eyes. If you know me, you know I’m usually more into bold and modern styles, but Vintage Christmas is the right amount of vintage that makes it perfect for capturing memories and traditions. I’m mixing a few different Simple Stories collections in this SN@P! album of pictures from last December and I’m using Vintage Christmas for just that. The collection is PACKED with embellishments. I love the layered chipboard frames and date tags. This spread has a couple of special things going on that went so well with Vintage Christmas. On the left, a story about making a stocking for our tiniest family member and the right a Christmas memory of mine. I added a few fun elements - I glued one of the chipboard layered frames right onto the outside of the page protector on the left page and used a photo flip on the right side to add some more journalling. On the right side I thought that my 2 photos would look great in one of the Insta Pocket Pages. With all the cute 2x2 cards in the Vintage Christmas SN@P! pack it was easy to fill in the little squares on the page. I added some simple chipboard and stickers to make this page come together in a snap. Once I got working on this page I realized I wanted to add some more journalling. I liked how everything looked together and didn’t want to change to a different page protector to make room so I added a 3x4 photo flip for some hidden journalling. There were some tab stickers in the 4x6 sticker sheets that were great for hinting at the page’s secret. The number tag fit in one of the 2x2 pockets perfectly. Under the Photo Flip I have some hidden journalling embellished with some stickers to finish off the page. The phrase stickers in the 4x6 sticker pack are SO good! Here is another layout I did with the Simple Vintage Christmas line. This one is from St. Nicholas Day, a tradition I grew up with and continue with my kids today. Our biggest thing is getting our stockings ready and making Christmas Lists to go in them. I used a variety of embellishments form Vintage Christmas - I love that chipboard Santa in the top left corner! He’s so traditional looking. Here I used one of the number tags on a 4x6 journal card for a mix of journalling and embellishing. Throughout my album I add some faux ribbon to the date tags using some of the Vintage Christmas washi tape. I fold the washi in half, thread it through the top of the tag and trim them to the perfect length. It really finishes off the tags nicely while matching everything else so well. No need to search for the perfect ribbon! I wanted to add some more extra journalling on this layout so I brought out the photo flips again. I used some more of the tab stickers from the 4x6 sticker pack- it really adds a nice touch to the flip. Underneath is some journalling and a picture from Christmas List writing. I am just loving Photo Flips while working on my December album. I can fill a page full of pretty pictures and embellishments and have some sneaky journalling underneath. And more pictures. I hope you’ve enjoyed this peek into my album! Hello friends! Maria here with a different post, this time I will teach you my tricks to plan the organization of your home. Now more than ever I need a good organizational tool to get to everything, so for my home I use a planner different from my bullet journal, which is more personal and helps me with making sure everything is organized at home! It is very important to organize the weekly menus and then go shopping, so we will buy only what is necessary. In addition I usually make two shopping lists one for food and another for household products. I usually make several weekly menus that I alternate, saving time. For cleaning I have a fixed template for the whole week, I am changing the secondary activities as needed. I usually use Sundays in the morning to plan everything. It's Kristine with you today and I am sharing a layout using the Happy Halloween Collection. It is a Simple Set which means it contains 6 sheets of a paper and a 6x12 sticker sheet. 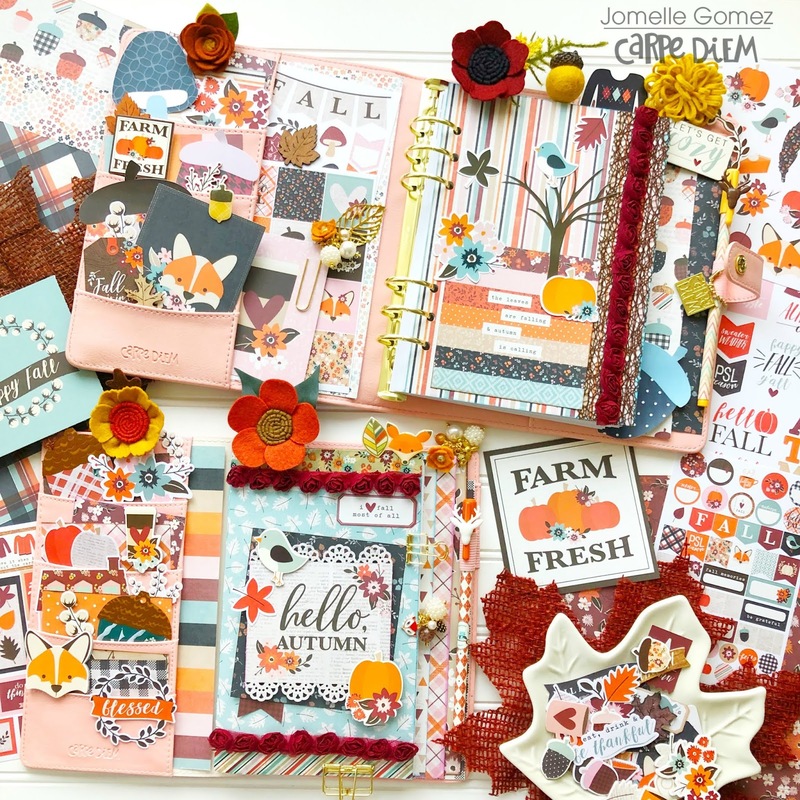 These kits are perfect for layout classes and creating 2 page layouts as well! With this layout I wanted a fun title but not black or simple. I really liked the 4x6 element card and wanted to use the word "Halloween"for my page title. I did some fussy cutting and added dimensional adhesive to the back of the letters and created a fun title. These are easy to do and with a little patience you can create your own! We have several possibilities with this sheet of paper with title that could include October 31 / Trick or Trick / Boo / and more! Here are a few more pictures of my layout. Hopefully you'll find some inspiration on my layout and create your own fun title using our element cards! It’s Creepy Cara here today and I’ve got my Traveler’s Notebook all spooked out for Halloween! I decided to go all the way and add as many bats and spiders as would fit… there are soooo many fantastic Halloween products that I wanted to use as many as I could. I wanted this planner to be on the scary side, I’ve usually gone the cutesy route in the past, but now that my children are mostly older (and 5 of those are boys) it’s nasty, creepy crawlies, all the way. Bats and spiders are actually quite cool if you ask me! Stay tuned to the end though, because I couldn’t help it and did add some cuteness to my TN after all. Starting with Halloween week I sectioned off the days with washi. I wanted thin strips of washi, so I decided to cut these strips from the black washi from the Halloween set, but the first strip ended up quite crooked. It was a happy accident, I liked how it looked so much that I purposely cut the other strips crooked too! I added a bit of the orange plaid to the 31st to help it stand out. I found some orange numbers in the numbers tablet but left out the 31st, I wanted to add something different to make it stand out and I eventually decided on this black phrase sticker, layered on a pumpkin after trying many other sticker combinations. Bats seemed to be my thing I turned to most and they are there as stickers, chipboard turned planner clips, and die cuts. Have I mentioned already that I really like bats? My 5 year old wants to be a bat for Halloween this year, and I think I’m more excited about it than he is. The trick with the bats is to make it look like they are flying on your page. Angling them each in a different direction and spacing them out really helps. On to my Halloween daily spread. Again with the bats flying around the page! I started with the black washi framing the spread on the edges of both pages and layering both edges with spooky stickers and quite by accident the ’31’ on the washi landed near the top of the left hand page. I highlighted it with stickers, including one that says ‘October’ (that I trimmed down) to make it into the date for the spread. Ah the cute bit! Halloween truly is a child’s holiday, isn’t it? The Happy Halloween collection really is sweet so I made a little pocket folder with my favourite paper and stickers. It’s quite simple to make, I folded up the extra length of the paper to make it the right height and so that serves as the pocket. Then I trimmed it to the width. I’m a bit lazy so I used an insert as a guide and eyeballed it. I only stuck down the outer edges of the pockets, the elastic from my TN holds the pocket together in the middle. If you'd like to follow along with my process, you can watch it here on my YouTube channel. This darling Snap album was so fun to make using the new Simple Stories Merry and Bright Collection Kit. I love how fast and easy all these pages come together!!!! They’re so easy and so cute!!!! I love adding fun fold outs for more pictures. I used ribbon to tie the fold out closed. The stickers are so cute and look darling popped up. This was such a fun project to make and so easy!!!! All you need is the Merry and Bright Collection Kit and a Snap album!!!! Hello lovely friends it’s Kylie with you again today. I have been setting up some more ‘Spooky’ goodness in my A5, Grape planner lately and having fun creating with the Happy Halloween Simple Set. 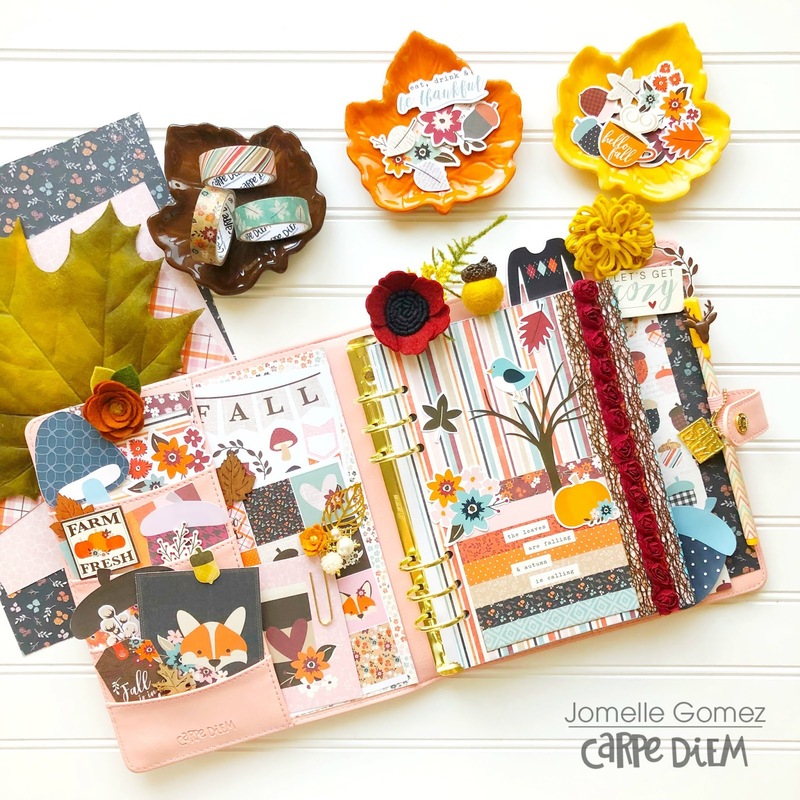 If you saw my blog post earlier in the month you would have seen how I was using my Persimmon planner with the Vintage Halloween collection, for my everyday planning. Here is my blog post if you would like to see it again. Since I already had my day to day planning covered I decided to use my Grape planner as a flip “mood and inspiration” board, to house some memory keeping and ideas for planning a perfect Halloween. The Happy Halloween collection is just so cute…….. The opening of my planner showcases a dashboard I created from the gorgeous printed papers, as well as some very full pockets of spooky cuteness. As always I loved the 3x4 & 4x6 elements sheet of paper for cutting apart the cute cards. I added a couple of these element cards to my pockets, purely for cute factor! I also used 3 x 4 element on my dashboard.The ‘Give me all the Candy’ was a definite favourite! For colour, I have also layered some contrasting papers in behind. The spider web was cut with a die from my stash which acted as a shadow behind my stickers. The back of my dashboard was all about Pumpkins! More layering of papers and finished with another 3 x 4 element. I added one of the 3 x 4 / 4 x 6 pocket pages to my planner. This was easy to do by covering the existing holes with washi tape and re-punching the holes to fit my planner with my Carpe Diem hole punch. The “Trick or Treat” phrase on the back, I cut with my Silhouette Cameo.It was a file I had found via the Silhouette store some time ago. I printed some smaller sized photos to add to my pages for memory keeping, tying in lots of the fun stickers to frame them.With the beautiful papers I tore some strips to act as a border to the top of my page as well as through the centre, which gave a nice overall texture to my pages. For my inspiration pages, again I printed my photos smaller to fit the page. I have created my own lettering by using some Alpha dies with the papers. As well as adding some of the 3 x 4 elements to my pages I have cut some of my favourites out and punched them so they fit onto my rings as a little tip in for my planner.By adding a free hand drawn border with a fine tip black pen helps them to stand out even more. Along the punched side of my pages I have used some washi tape.Not only does this add colour to your pages but it serves a practical purpose by making the holes extra sturdy. Here is another extra dashboard I created, including one of the 4 x 6 elements. Overall I love the fun vibe the Happy Halloween collection has given my planner. Thanks for stopping by today! 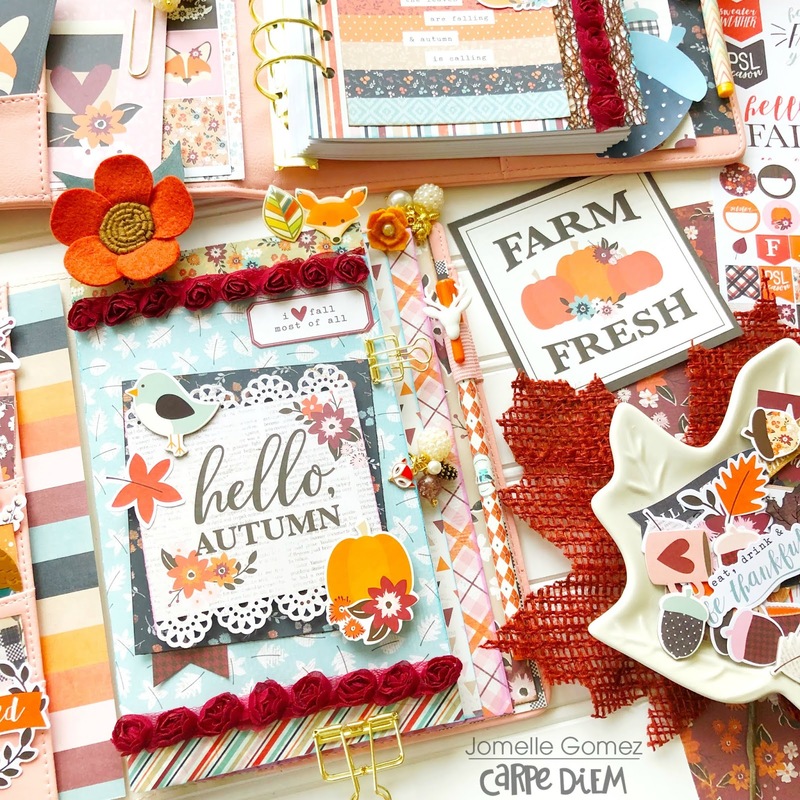 I hope you have some fun creating your own faBOOlous spread in your planner for Halloween. Howdy friends! It's Layle, Simple Stories Marketing Director, & I'm back for another blog post. Welcome! Halloween is less than a week away and that means November is just around the corner - this year is flying by, where in the world does the time go! 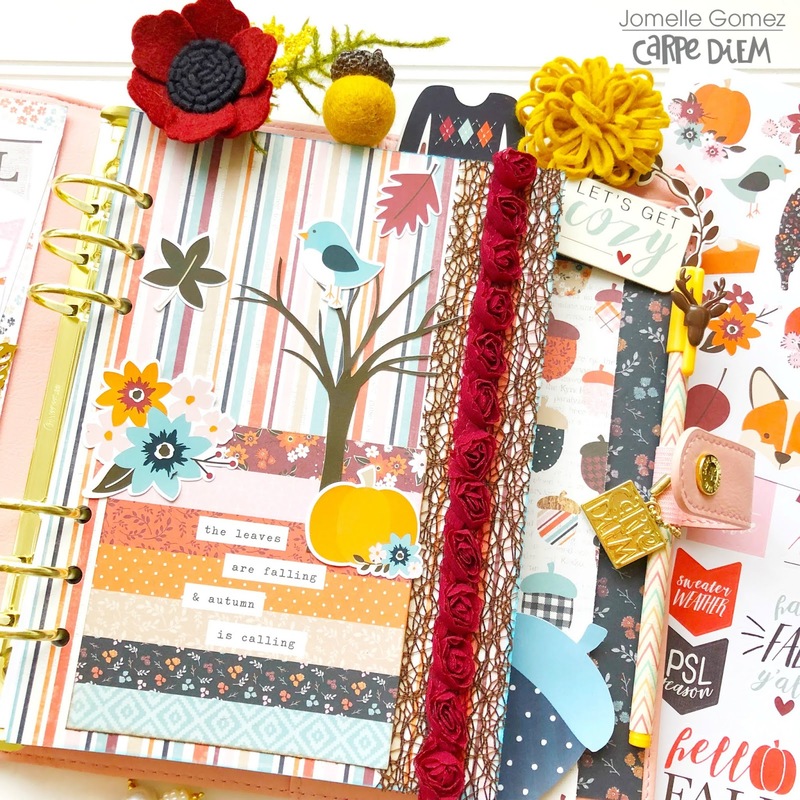 A new month means new Free Printables & a new planner set up! I started out by decorating the pockets with a mix of the 3x4 Element cards & the free printables dashboards. How cute is that little house?! Here's a tip - I always print the Traveler's Notebook inserts that have the dashboards on them; they don't have the tabs for you to punch the holes like the A5 and Personal versions, so they're great for decorating pockets, cards or scrapbook pages! Next up I used one of the papers from the printables for the opening page in my planner, then I added a tree sticker from Forever Fall & used another one of the dashboards - the wreath - for the top of the tree. Here's the 'before the pen' version of the November dated calendar that I decorated with stickers from the Seasons A5 Sticker Tablet. I used another one of the printables to get a jump start on planning for Thanksgiving dinner! As always, there are tons of pages in the free printables! If you haven't grabbed them yet, what are you waiting for?! 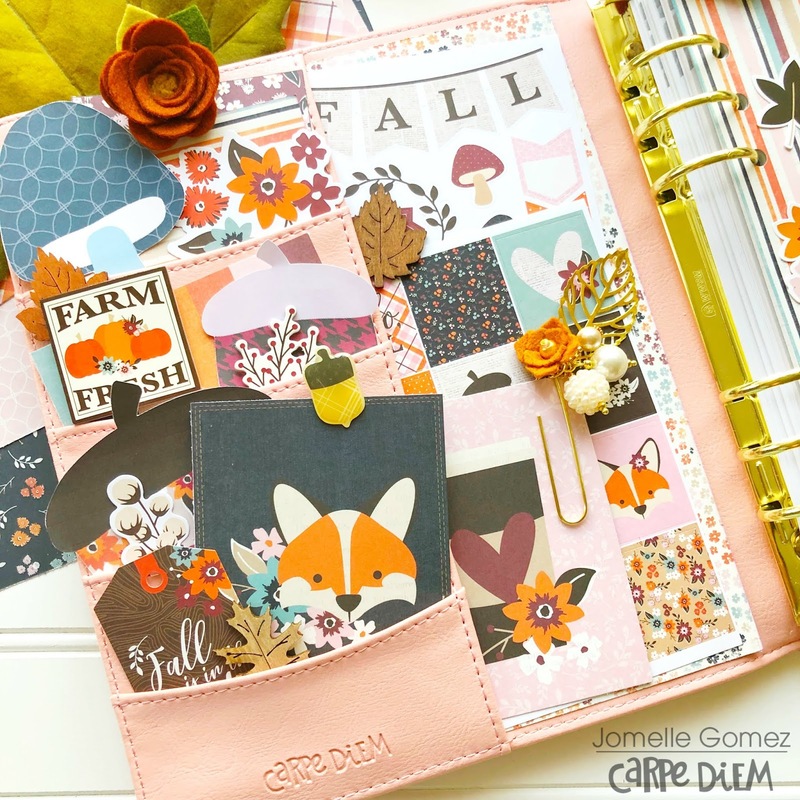 Designed for use in your Carpe Diem A5 planner, personal planner, Traveler's Notebook, on your scrapbook pages, in your SN@P! albums & more - simply download, print, and trim. Click HERE to visit our Project Downloads page for these free printables along with many more! Hello everyone!! Jackie G on the blog today to share a BIG Halloween album with you all using the amazing Simple Vintage Halloween collection!! I’m not joking…this album is BIG!! Measuring in at 8.5”x11”!! Halloween is my family’s favorite holiday, so I needed something massive to hold all our photos in!! Do you celebrate Halloween?? What are your favorite traditions? We love getting together with family, having a big cookout in the driveway to pass out candy…and of course taking the kids trick or treating!! So because of the size of this album, I ended up using two collection kits. I wanted my cover to resemble an old vintage book so I used plain chipboard distressed with some Tim Holtz vintage photo Distress Stain, making sure to really saturate the edges so they would puff up and curl a bit. I also took some kraft cardstock and distressed that as well, including some splatters of black paint. This was used for my actual spine. Each of my pages are pocket pages with the top opening for a large photomat to store lots of pictures!! I used regular flat stickers, chipboard stickers and the bits and pieces to decorate each of the pages!! To give me lots of extra photo space I created a waterfall in the back cover!! This is one of my favorites to put in a mini album because of how many photos you can fit into one. Plus, you can customize it to whatever size you need. I hope you have enjoyed this BIG album and it has inspired you in some way!! Thanks for stopping by!!! A Very BOOtiful Planner Setup! Hey Planner Friends! It’s Rachel again, and I’m here to share my Persimmon A5 Planner setup for the month of October using the Simple Vintage Halloween Collection. This collection has me feeling nostalgic with its vintage, storybook feel. I love all the illustrations, especially the cheeky pumpkin characters and mischievous little cats! The cats peaking out of pumpkins remind me of our own little rascal cat! As always, let’s start with the pockets! I have a mix of the chipboard pieces and the bits and pieces from the collection tucked into my pockets. Those pieces on the outside of the pockets are adhered on with some removable roller adhesive. Because of the materials of the planners, I never have to worry about ruining them - sticky adhesive rubs right off (when you want it to!). I backed the large vertical pocket with some patterned paper from the collection and use this pocket to store the 4x6 collection stickers for easy access. How cute it the dressed-up girl peaking out of the pocket! With such a cute washi set for this collection, I wanted to try and make a washi dashboard. I love how it turned out and it was super easy to make! I laid the washi down on a piece of white card stock, trimmed it out, and adhered the back of the card stock to a paper from the collection. This is a great project to get some extra mileage with your washi, and be able to display it in an eye catching way! I did add a few other washi’s from other collections, but you could easily make this dashboard with just the three in this collections. Next up was the divider for October. I am a big fan of this plaid paper, and couldn’t wait to make a divider out of it. To measure out my divider, I traced around the A5 Divider template. I used a paper trimmer, but you could also use the template like the photo crops and cut right around the template! Once I had the divider trimmed, I used the planner punch to make the punch the holes. I then pulled some stickers from the combo stickers sheet. This collection has stickers that come already layered into adorable clusters! If you are like me and are somewhat new to planner decorating, these clustered stickers and images are a life saver! See that sticker at the top? Yep, it came like that! All I had to do was peel it off the sheet and place in on the page! Same with the October tab! This is is great for people who love the look of layers, but maybe don’t have the time or experience to expertly craft an embellishment cluster. I decided to put a little decoration on the page that appears before the monthly layout. I plan to document some great past costumes that my husband from years past. Spoiler alert - he is much more creative than I am when it comes to costumes! Here is a look at the monthly spread. I started by dating the pages using the It’s a date stamp set. After the pages were dated, I filled in the major events using some icons from the Get It Done Stamp set and stickers from the 4x6 set. I added a strip of washi to the top of the page and layered some more stickers on top. The little word strips are always so clever! I love the monthly layout because I can plan around with the decoration, while still leaving room for the important details of the month. It wouldn’t be a project from me with out a little planner hack! For the weekly pages, I wanted to create a little bookmark with pieces from the collection. I decided to trim down a 2x2 insta pocket page to add chip board stickers, paper from the collection using the 2x2 photo crop, and the bits and pieces. To the top, I added a monthly tab from the Tabs sticker tablet and a washi paper clip banner. On to the weekly layout! 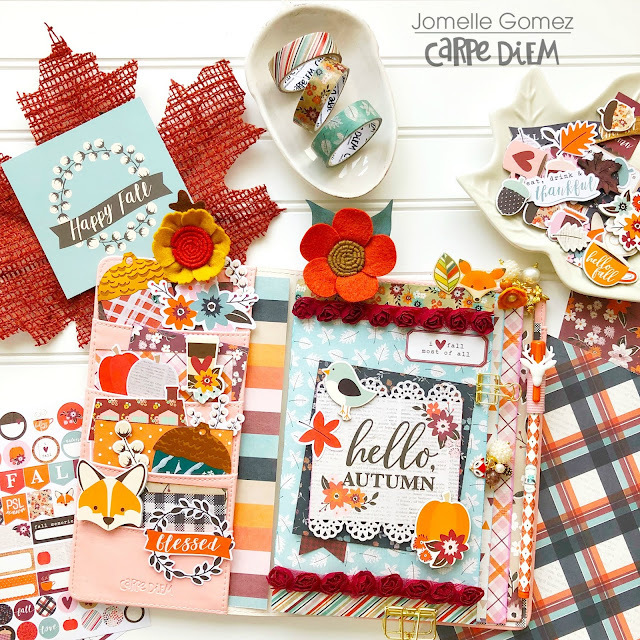 Because Carpe Diem Inserts are undated, you can play around with all the different layouts! This month, I wanted to use the fitness layout. To make it work for me, I simply covered the far left column where each of the boxes are labeled and placed stickers along the bottom where the hydration tracker was. I dated the pages using the numbers A5 Sticker Tablet, a must for undated planner inserts! I even made a ho-hum task list playful by adding bats as bullet points! Here is a look at the pocket page place marker in action. This is a great way to liven up a planner page, especially if you don’t have time to decorate the planner page itself. For the second half of the week, I tried to keep some white space for those events and to do’s that come up as the week progresses. I hope you enjoyed a look inside my October planner setup! Even if I don’t dress up for Halloween this year, at least my planner looks the part! Until next time, I hope you have a BOOtiful October and a Happy Halloween!